According to author Cindy Wigglesworth, Spiritual Intelligence is "the ability to behave with wisdom and compassion while maintaining inner and outer peace regardless of the situation." 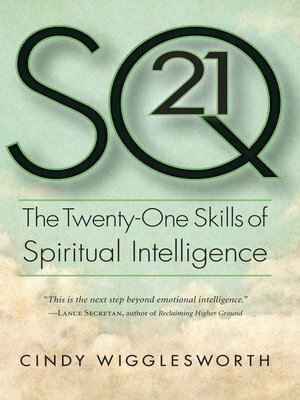 In her new book, SQ21: The Twenty-One Skills of Spiritual Intelligence, Cindy helps us understand how spiritual intelligence is analogous to such concepts as IQ and emotional intelligence (EQ). Using clear, practical language she defines the "21 skills" that comprise spiritual intelligence and in doing so, teaches you the steps to begin developing your own spiritual intelligence. Cindy refers to her method as "spiritual weightlifting"—a process whereby we work to develop our "muscles" to shift away from thinking with our self-focused ego to behaving from our more loving and peaceful Higher Self. Her model is both faith-friendly and faith-neutral, and SQ21 offers a way for atheists, people of faith, and those who are "spiritual but not religious" to understand each other and discuss our universal concerns. These skills are especially crucial for those in positions of leadership, since they help us to make decisions on a higher level while in the midst of stress, complexity, and high rates of change. If you want more peace, wisdom and compassion in your life— SQ21 is the book for you.